Before beginning, have students complete the “I am thankful for” paper. 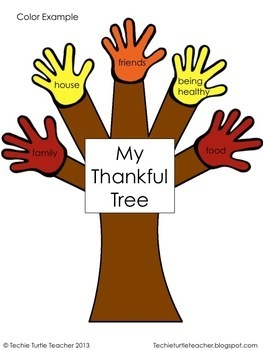 They will use this to make the Thankful Tree. There are many different options you can use in this product. Use the outline of the hands and the tree trunk. Have students color their own hands and tree trunk or copy on colored paper. 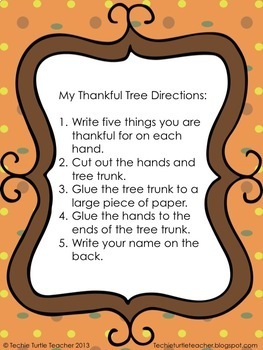 Students can cut out the hands and tree trunk to put together their own tree. 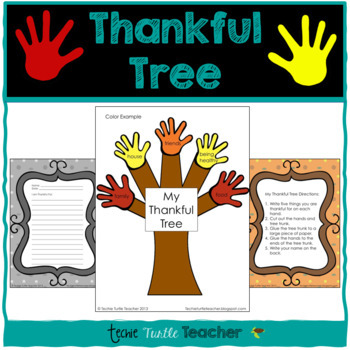 Give students the already made tree to write their ideas on and color. Display the color or grayscale example and have students create their own trees. They can trace their own hands on colored paper and draw their own tree trunk. If you have any other ideas on how to use this product, please let me know by leaving feedback.